Digital print on back surface of acrylic sheet, 88 in. h x 48 in. w. x 3/4" thick, each / stainless steel hardware, 6 in stand off from wall, lighting. The two panels of Landscape Projection: The Sea within the Land (Salinian/Franciscan), 2015, are homologous to the similar-scale, Landscape Projection (For an Unknown Window), series, 1998-2011, printed on photographic paper. These works have in common digitally altered images derived from the contemporary natural and meta-natural land/seascapes. The original photographic image is compressed to fit into each of four sides of a ‘frame’ surrounding an open void in the center of the work. This central negative space is physically absent. The proportions of the void are similar to that of a generic window, (an 'unknown' window of a conceptual building...). Landscapes Projection: The Sea within the Land (Salinian/Franciscan) evokes a theoretical dimension and sea/land dialectic in an architectural context, that considers the Carmel site as a function of larger sea/land dynamics: the local area’s Salinian, marine sedimentary structures transported by plate tectonics and an analogous Franciscan complex of earlier accretion episodes further inland, as subsets of marine depositional systems and oceanic-plate subduction dynamics of the North American Western Cordillera. This dialog suggests the complex, interrelated and fluid conversations of the sea and the land in the manifestation of our environment both natural and built, Anthroposcene and pre-human. 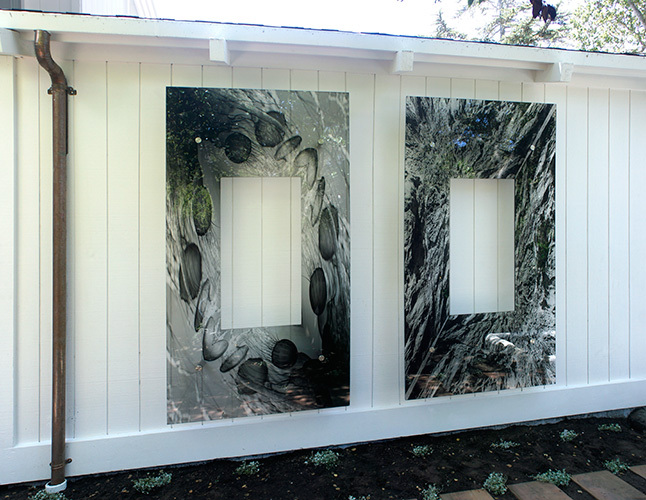 The left panel’s image is abstracted from jellyfish of the Monterey Bay Aquarium, the right panel’s image is derived from that of Franciscan complex assemblages of the Marin County, CA shoreline, a stratigraphic ‘ship’ may be seen embedded in its structure and is an iteration of Landscape Projection (for an Unknown Window), No 5, 2002.